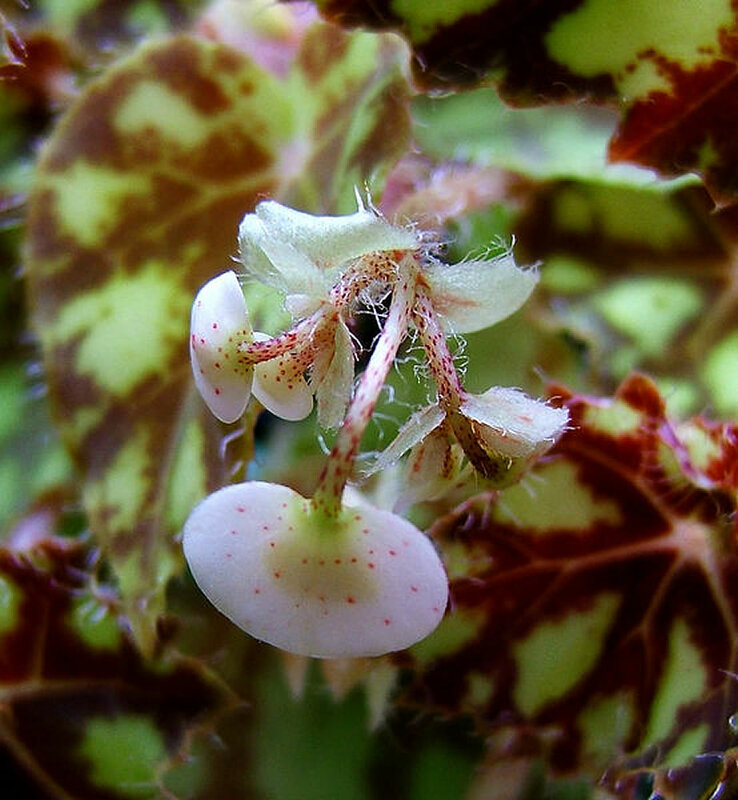 Distribution and habitat: Begonia bowerae is a native of tropical Mexico and its natural habitat is the shadowy area on the floor of the tropical forest as ground-cover and non-stem-forming plant. This creeping rhizomatous Begonia grows up to 25cm (10 inch) tall and is spreading up to 18cm (7 inch). 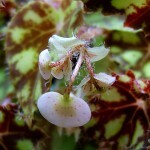 It is a miniature Begonia with straight, scattered, single hairs on petioles, leaf margins and peduncles. 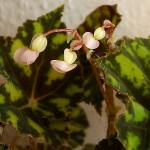 Begonia bowerae is usually offered under the incorrect name: Begonia boweri. This is a fantastic Begonia that is heavily used for breeding to create new exciting cultivars and is itself rarely on offer. 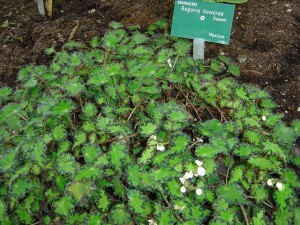 Description: Begonia bowerae it is a tender perennial that grows from a creeping branched rhizome (underground stem). It is a bushy, stemless plant, about 15-20cm (6-8 inch) tall. The small, heart shaped leaves are deep emerald green with black edging and with stiff hairs on leaf edges and leaf stalk. The purple-burgundy to nearly black markings may also create bands along the leaf veins. In late winter and early spring it produces loose clusters of white or light pink male and female flowers that are held on thin pink stems above the foliage. The flowers are tiny, shell shaped, produced on 10-15cm (4-6 inch) long stalks. 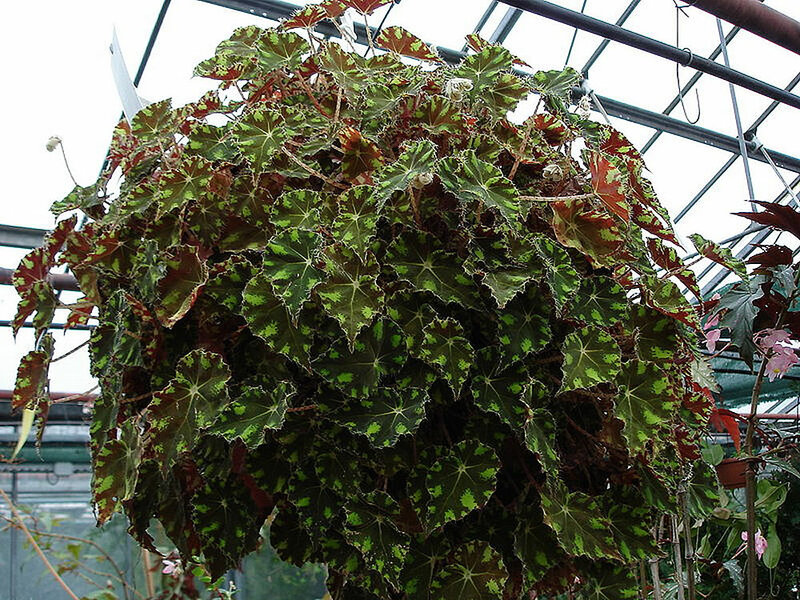 Houseplant care: Begonia bowerae cultivars are among the most preferred indoor plants for their rich colours of the leaves and because the relatively rapid growth. Pinching tips and pruning outer stems in the growing season gives a bushier plant, good for hanging baskets. Remove dead foliage to prevent disease. 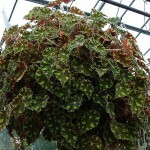 Light: Begonia bowerae are grown primarily for their foliage. Their leaf colours will be saved only when the plant is kept in high humidity and away from direct sunlight, but well-lit location. A shaded greenhouse or a window free of direct sun also will suffice. Although this plant enjoys filtered light, it can take some sun in winter. These plants do not like changing their position. Temperature: Normal room temperatures are suitable for actively growing plants, preferable at least 15°C (59°F). Give to these plants fresh air as much as possible and avoid draughts or cold air. Begonia bowerae suffer in dry air. For increased humidity stand the pots on trays with moist pebbles or suspend saucers of water under hanging baskets. Watering: As these Begonia bowerae plants are able to store large amounts of moisture in their thickened stems they require less moisture than most other Begonias types, especially during the colder months. Water regularly with trepid water, so that the potting mixt stays always moist, but never soaking-wet. Do not spray mist this plant and avoid getting the leaves wet when watering. In winter, this plant dislikes conditions which are too moist and too dark. In this period water the plant more sparingly, allowing the top half of the potting mixture to dry out between waterings. Feeding: Apply standard liquid fertiliser every two weeks to actively growing plants. Potting and repotting: Use either a peat-based mixture or a combination of equal parts of soil-based potting mixture and coarse leaf mould. Put a shallow layer of clay-pot fragments or other drainage material in the bottom of the pot for extra drainage. Begonia bowerae is a rhizomatous begonia and has shallow roots, therefore is best planted in shallow pots or pans. Move small plants into the next size of pot or pan only when the rhizome has grown across the entire surface of the potting mixture; do this preferably in spring. Discard aging rhizomatous Begonia bowerae in favour of attractive new plants. When potting or repotting a Begonia bowerae, simply sprinkle some mixture around the roots and tap the container briskly to settle the potting mixture. Do not firm it down with the finger as this procedure may damage the roots and stems. Gardening: Begonia bowerae can be grown outdoors in pots, in the ground to form groundcover or in hanging baskets in filtered light and moist, but well drained soil. In mild winter areas, they may remain outdoors year-round as long as they do not freeze. Tip pinching early develops a well-rounded plant. Pruning usually consists of replanting an old plant that is crowding itself. Rhizomes often will grow over the pot edge. This forms a nicely rounded plant and, unless it is not becoming unattractive, need not prompt pruning. Once Begonia bowerae have finished flowering, pinch out the growing tip to encourage the development of laterals and a fuller plant. Old leaves should be removed at the end of winter. Position: These rhizomatous begonias grow nicely when given adequate light without strong direct sun. Under a shade structure or a tree is a good place to grow them outdoors. Soil: Begonia bowerae plants prefer well drained soil rich in compost or organic matter. They like an acidic soil with pH ranging from 5.5 to 6.5. Humidity around 60 per cent is ideal and good drainage is essential. Irrigation: In the garden, water deeply as required, which is not as often as people may think. They should be kept on the dry side, as overwatering them can be fatal, whether they are in a pot or garden bed. Begonias are succulent or semi-succulent plants so accept quite dry conditions. Overhead watering would not harm them. Fertilise: Feed these plants with liquid fertiliser at three of four weeks interval. Propagation: Cut off 5-8cm (2-3 inch) long growing tips in spring or early summer. Trim each cutting immediately bellow a leaf, carefully remove the leaf and dip the cut end of the stem in hormone rooting powder. Plant the cuttings in an 8cm (3 inch) pot of moistened equal-parts of peat moss and coarse sand or perlite and enclose the whole in a plastic bag or propagating case. Stand it in bright filtered light until renewed growth indicates that the rooting has occurred – about three to six weeks. Uncover the rooted cuttings and begin to water it sparingly and to apply standard liquid fertiliser about once every two weeks. Do not overwater these hirsute Begonias which will rot if kept too wet. About six months after the start of propagation, move the young plants into a slightly larger pot of standard potting mixture for mature Begonia bowerae. Another way to propagate Begonia bowerae is to cut a rhizome into 5-8cm (2-3 inch) long sections, each with at least one growth point. This way of propagation have to be undertaken in spring. Treat the cut ends of sections with sulphur dust. Plant each section half in and half out of slightly moistened rooting mixture in a 8cm (3 inch) pot or pan. Use a rooting mix of equal parts of peat moss and coarse sand or perlite. Place the section either horizontally or vertically, depending on how the parent rhizome was growing in its container. Enclose each planted piece of rhizome in a plastic bag or a propagating case and stand it in bright filtered light. Roots should form in four to six weeks. When two or three new leaves have appeared, uncover the little plant, repot it in an appropriate container of the recommended potting mixture and treat it as a mature plant. 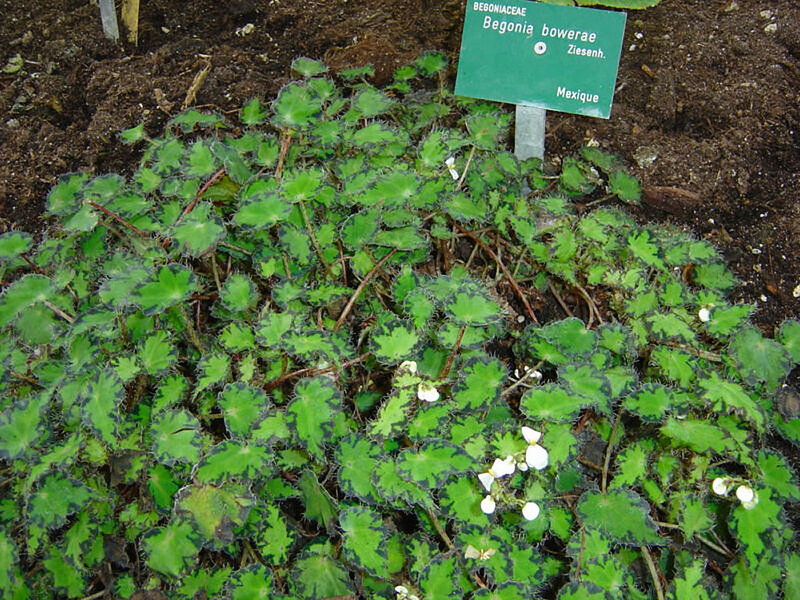 Begonia bowerae can be propagated also from leaf cuttings in spring. Take a healthy leaf with 2-5cm (0.8-2 inch) leaf-stalk attached and plant the stalk at an angle of 45° in a small pot of moistened propagating mixture recommended above or insert several leaves in a small pan or seed stray. Enclose the whole in a plastic bag or propagating case and stand it in bright filtered light. Rooting should occur in two or three weeks and tiny plantlets should appear from each leaf after a further two or three weeks. Several plantlets are generally clustered together. When each of them has produced at least two recognisable leaves, pot the plantlets up singly in 8cm (3 inch) containers of the recommended potting mixture for mature Begonia bowerae. Before treating the little plants as adults, however, dampen the mixture sighly and put the plants back in a plastic bag or propagating case for another four weeks. This will acclimatise them to normal room conditions. Begonia bowerae can easily develop mildew if wetting its leaves. Treatment: Spray these plants with a suitable fungicide at regular intervals. The only pest these plants seem to be affected by is the snail. Treatment: Use snail bait around them. Companion plants: Begonia bowerae can be planted together with few different types of Begonias with contrasting colours and shape: plain leaved ones can be alternated with patterned forms and / or juxtaposing silvery leaves with darker foliage. They also contrast well with upright, strap-leaved plants that tolerate dry shade, such as Liriope species, renga-renga lilies (Arthropodium cirratum) and bromeliads, as well as with ferns. Begonia bowerae cv. ‘Tiger’ has olive-green leaves with light green spots. The undersides of the leaves and the brittle, juicy stems, are wine-red. 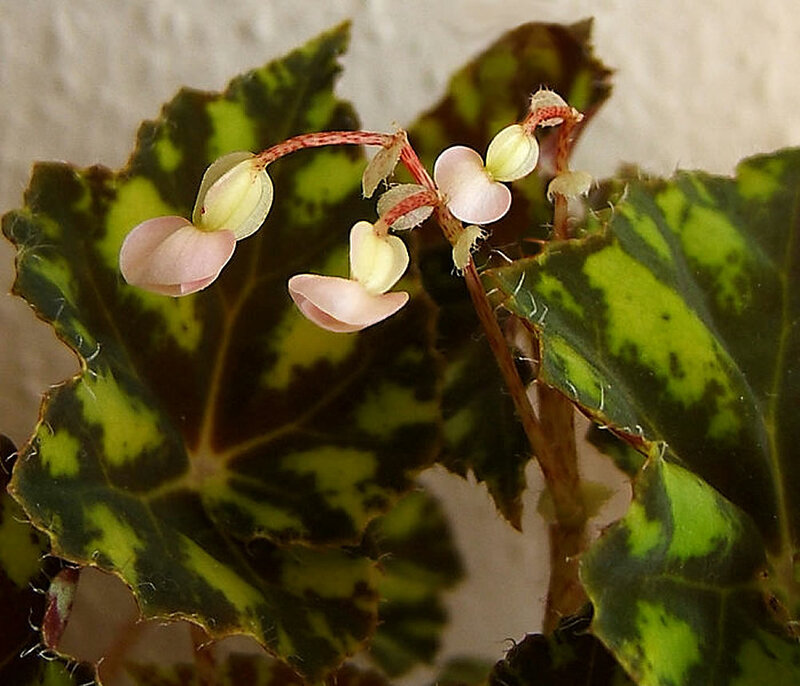 Uses and display: It is regarded as one of the prettiest begonias for foliage and its relative ease of culture as both a houseplant or annual bedding begonia. As a houseplant it is favoured for culture in a terrarium or glass bowl. Also it can be used as groundcover for shady tropical gardens. In frost-prone regions use it as a seasonal annual accent in containers, hanging baskets or window boxes where its ornate foliage can be highlighted.